If you live in Randolph NJ or the surrounding area and need a trusted veterinarian to care for your pets – look no further! Dr. Lori Holland, VMD, and her staff are here 24 HOURS A DAY 7 DAYS A WEEK treating all kinds of our favorite pets. From emergencies to wellness visits we are here to help! Your pets’ health and wellbeing are very important to us as we take every possible measure to give your animals the care they deserve. Alliance Emergency Veterinary Clinic is a full-service veterinary hospital located in Randolph, NJ. From its inception, Alliance was formed to support pet owners and their pets during times of crisis. AEVC has been providing exceptional emergency and critical care to Morris county and surrounding areas for over 24 YEARS! Alliance is proud to announce that we have expanded our emergency practice into a Wellness Center as of 2017. 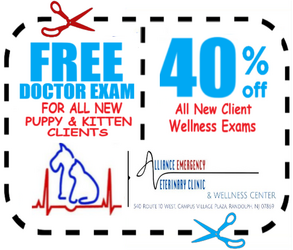 Mondays through Fridays, 9am-5pm, we accommodate day clinic hours for wellness exams and non-emergency related visits, courtesy of our daytime Doctor of Veterinary Medicine, Dr. Deborah Burke. We as medical professionals and caretakers believe that owners should be given the knowledge needed to make wise and informed decisions, especially during traumatic or emergency situations. We are happy to offer a number of resources that enable you to learn about how to take better care of your pets. Please feel free to browse our site, particularly the informational articles. The best veterinary care for animals is ongoing nutrition and problem prevention, therefore we believe and focus our efforts on our clients becoming knowledgeable about preventative pet care. If you have any questions, call (973).328.2844 and we will promptly get back to you. Our veterinarian office is very easy to get to - just check out the map below!